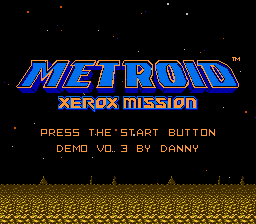 Metroid Xerox Mission is a work-in-progress ROM hack being worked on by me, DannyPlaysSomeGames. The goal of the project is to fuse the world of Zero Mission onto Nestroid. So far, a demo is out, covering both Brinstar and Norfair, which is attached to the thread. Please note that the game is still in development, so please critique any bugs or problems you might have with the game in order to assure a good final product. 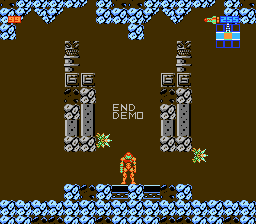 Well, it has both Brinstar and Norfair, revamped levels and spritework based off Zero Mission, a shiny new hud alongside the + Saving patch by Snarfblam (huge thanks to him) that includes the walljump and minimap, and a few quality of life edits here, like reducing missiles required for doors and more missiles on pickup. When is the whole thing coming out? You heard this answer a thousand times, so take a wild guess. Hey! Can it have x/y feature? Every new feature considered has already been implemented or planned, and due to my extremely limited understanding of knowledge of ASM, those features are probably the only ones to be implemented. Is that banner going to appear in the game? No, it was just a quick thing I whipped up in paint.net as promotion. As nice as it would be to have cutscenes, it'd be overdoing it a bit. Are those save stations? Why don't they work? First off, no, those are actually recovery stations, that replenish health to maximum (you can now save manually via Up and A on controller 1, which brings you to the game over screen to save from there). Unfortunately, though, it hasn't been implemented as of yet in the demo because every time I try to implement it, it resets the game on startup, so I'm still looking for a way to implement the HealyTileASM from Snarfblam (again, huge thanks to him) without it crashing. So for now, it's decorative. Hey can I help on...? This is a bit of a one-man project, so I rarely ask for assistance, unless it's something really difficult like the HealyTile ASM (and even then, I usually ask for help when I know I can't do that). 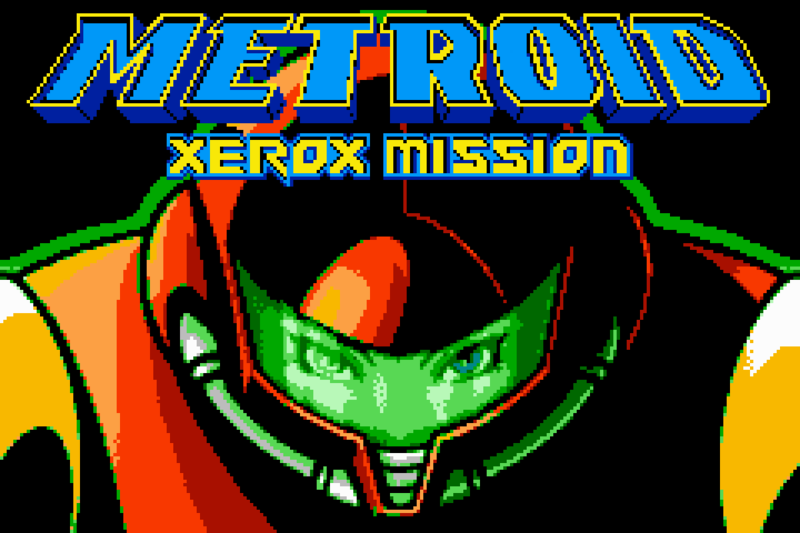 Besides, I already have most of the assets I need (mainly the Metroid 1 disassembly and sprite rips of Zero Mission). Will (insert other areas here) get a demo? There might be a demo for both Kraid and Ridley, then finally be fully released with a properly redesigned Brinstar and Tourian. Metconst Discord - lots of advice and very helpful people. Consult them if you want to try Metroid ROM Hacking of any kind yourself. If you want to leave feedback of any kind, post a reply. This was made in a rush, so if anything's off, just point it out. Daaaaaaaaang dude this looks damn awesome,Im looking forward to this project,also,is this romhack going to have remixed music? Pretty good graphics considering I couldn't tell at first glance if it was Nes Graphics or Snes Graphics. Thanks! 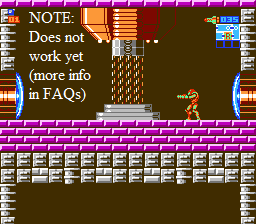 I've considered altering some of the tracks (like extending Kraid or Norfair, or giving Ridley and Kraid their proper boss themes), and I know there's some space in the ROM too because every area bank repeats every song in the game, which means some songs tend to be unused. However, I've never actually composed before, so I'm unsure on how to convert those songs. Worst case scenario, it doesn't end up in the hack, or I'd probably just look up sheet music of the songs then convert it with Metroid Tuner somehow. Heh heh no problem,I see well if that's the case,I'll keep my fingers crossed. The one critique I would offer, based on the screenshots so far: The background color seems to make everything look a little washed out. Aside from that, everything looks great, so far. The brownish colour really doesn't play well with oranges and yellows, I would recommend sticking to a more dark colour, like a dark blue or go for plain black. The new sprites also don't shine as much as they could due to the background colour meshing with them sometimes. I experimented around a bit with the background colors. Using your preferences and a few ones I added. 08 - I think the brown does look a bit too bright, so I might change that. 0F - The issue I have with black is that it kind of seems lacking to me, especially with the style that I am going for and the way I kind of use it as a negative color of sorts (which you can kind of see with some of the other screenshots). 0C - It does look a bit nicer, but I think I could use something better (although props for it being the only dark blue that doesn't make my eyes bleed). 08/0A - I think green looks nicest, and the one I'd probably like using (specifically 0A, because I think it looks slightly better). 30 - Best subjective color. Period. Leave a reply on which one I should go for. Call me stubborn, but I think the black background (0F) does hold up the best. It makes it so you can clearly see where enemies are, and what the sprite art goes for in each detail. It really makes them pop up. 0C (blue) and 09/0A (green, I think you made a typo with 08 there) could have problems. The blue one might collide with some of the other assets, as Metroid tends to use a lot of blue hues for some maps, and the same applies for the green for some portions of the game like Kraid (was it Kraid that used green? Can't recall exactly). Maybe try a more dark blue? Something like 01 or 02, see how it looks, if not then try something like 2D (dark gray). That's one problem with the NES, it kinda has a limited palette when it comes to dark colours to have a nice background. Alright, so I tried using other blues and the other gray. The issue I had with the other blues (01,02) is that they're ridiculously bright. But now, I see that 01 kind of fares a lot better. Even then, I kind of think it looks weaker compared to 0B, but still good enough of a choice IMO. 2D looks way too ugly. It's due to the fact that FCEUX makes the two colors way too similar. Besides, I already have 00 in one of the temporary palettes, so that's not helping. Overall, I'd probably stick to either 0B or 0F. The photo is ordered from left to right and downwards by my preference of which looks best to worst. Except for white. White is amazing, but too amazing for this hack. Pic 1 (upper-left) and 7 (bottom-left) look best to me if you are dead set on not using black. The thing for me is that no matter what color you use short of adding a color via a custom emulator palette, it is going to look hazy. Not really something desirable in the first area of the game I think. 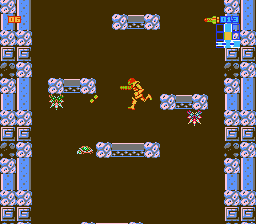 On the other hand, that brown from an earlier pic would work better in an area like Norfair to make it look hazier as it often is in later games with transparency and smoke effects that can't be done on the NES. So that's something to think about. If you could manage to get black into the palette of the environment tiles, it would give it that much needed contrast. Since those tiles appear to be using the transparent color in the palette, you'd have to sacrifice one of the actual colors. If you're going for a certain style, it might be worth trying out just to see if you get any good results. As for my preference, I like the black background the best, followed by the bottom left. It might look better if the bottom left was a bit darker, though. Most of these just need more contrast, I think. Unless that "hazy" effect is something you want! It'd be interesting to see that white background, but with having darker (maybe black) colors in the actual environment. It's just that I wanted to give off more vibrant colors instead of it being just black. 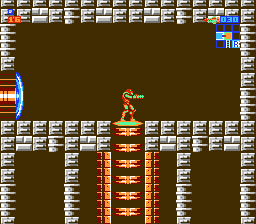 It was the closest I could get in replicating an actual background without an actual background (since all background tiles are displayed in front of Samus, creating the illusion of foreground). I feel like black would just look bland, in all honesty, but I can see where you're coming from. Maybe I could make a possible patch where there's no colored backgrounds and one with colored backgrounds. Seems like a good middle ground. Also, yeah, I think Norfair works really well with the brown background if you've seen from the pics I've posted. I think it'd work on Ridley the same way. 1. Make a patch with black backgrounds. Hmm... Fair point. I kind of like the black a bit now that you mention it. Either way, I feel like the two patches is a good happy medium. 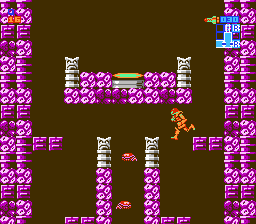 Yeah, NES isn't so good with specific color choices. It's either way too saturated or not dark enough. That's probably why some NES games look like trash. Good idea, I'll add that to my list of "bizarre yet surprisingly effective torture devices" that I never knew I had (who knew eye bleeding was so effective). Jokes aside, I'm pretty sure you would go blind after a while. Even if it did somehow worked, it's not the style I'm going for anyway. Either way, thank you for all the feedback, it's very much appreciated! My curiosity got the best of me. I made a mock-up of what it would look like if the environment tiles had black in their palette. Keep in mind, this mock-up takes into consideration the limitation of the palette, and for the tiles with not much detail, I just guessed on their shape. (like the pillars) I used your bottom left and bottom right examples in this. Hmm... it's an interesting attempt. the thing is that with some tinkering, I could see it working almost. But either way, it's not the artstyle I'm going for, but a good E for Effort. At least for the left one. The right one doesn't work because Samus and the enemies are drawn in a way in order to create a pseudo outline, and it wouldn't look good with something like white. Still, a very valiant effort. Overall, it looks kinda decent, but again, not the artstyle I'm aiming for. Looking back at your examples, I'm starting to lean more toward the top left. I'm sure what you decide will be good! Your hack looks great so far! 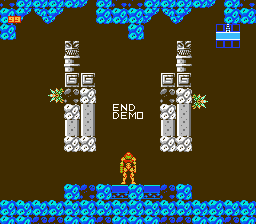 I always enjoy seeing Metroid hacks progress. There's just something about them that is very appealing. Looking forward to seeing more! -Two new patches - one with black background and the other with colored backgrounds. -Redrawing some of Samus's sprites to make her arm cannon more consistent (her standing and aiming upwards sprites, more specifically). -Changing the game over screen to look just a bit nicer. It's not too much, but something I wanted to address nonetheless. Don't expect any more updates like this, though. Next update is most likely gonna be the Kraid/Ridley one. Unfortunately, with school and life in the way, that might take a while to get rolling. But rest assured, I'll make sure to not disappoint when it comes out. 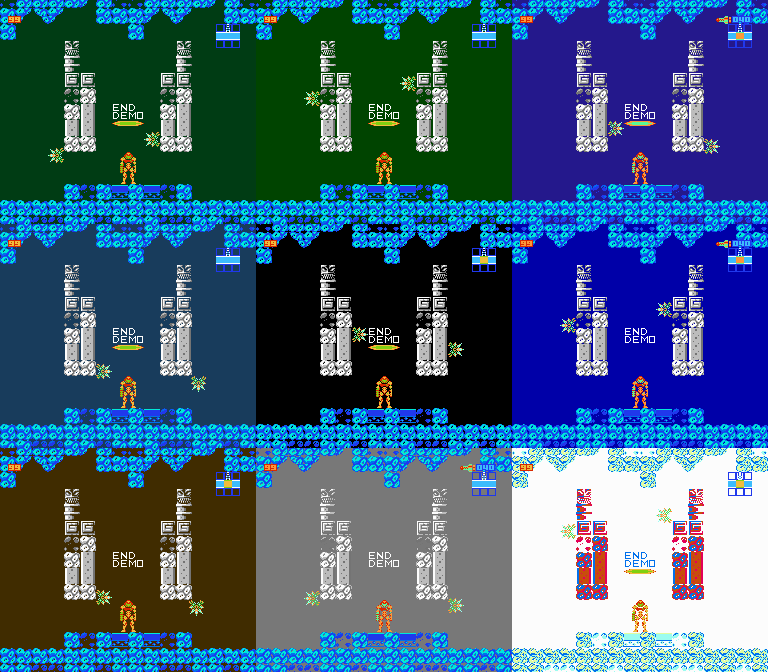 Alright, after plenty of work and consideration, I have essentially finished almost 100% of the background tilesets. 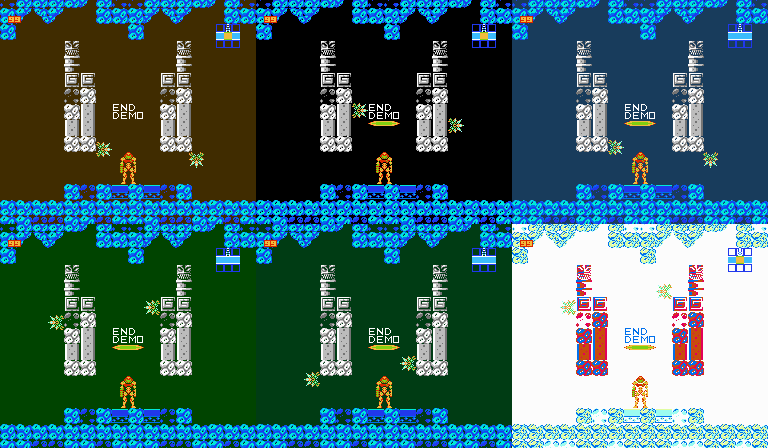 What remains now is just a bit of Tourian (as in, air tiles, Zebetites and MB herself) and (maybe) a bit of the title screen (although I have considered revamping all of the rock tiles in Brinstar). All of them are already implemented, except Tourian, because that's going to be one hell of a beast due to how it messes around with background physics so weirdly. Here's all of them in their grand, 8-bit and greyscale glory. I changed the physics of a row from breakable to solid for more space. I used a lot of efficiency and economy (as in, make everything fit via sharing tiles), especially in Kraid/Ridley (which are now the same tileset for special reasons) and Tourian, so keep that in mind. 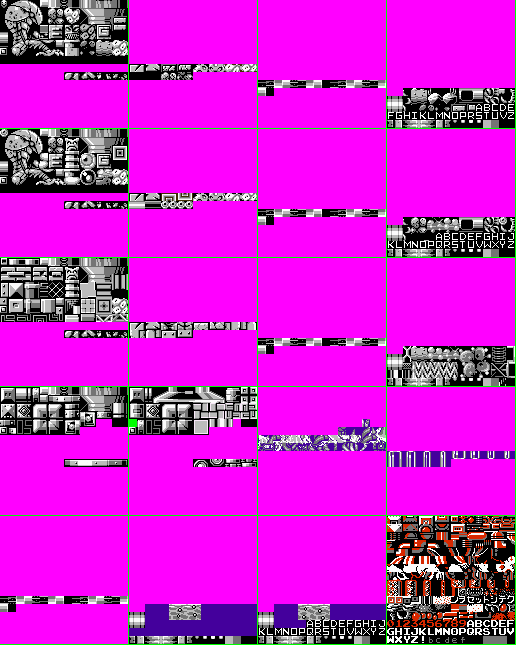 But yeah, this tileset is almost a finished product. It's gonna take a long while, though, so don't expect it coming out this spring. But yeah, a good chunk graphics-wise is done. for background I really like the dark black next would be top left then bottom right. the white is awful LOL. Yeah, white was clearly done as a joke. I've already given the option to chose colored or black backgrounds via different .ips files, so no need for more input, but thanks anyway. Page created in 0.129 seconds with 18 queries.